UPDATE: Even though Miguel is free we still have to prepare for his immigration hearing so please keep signing the below petition! 10/14/16 Burlington, VT--Vermont human rights leader Miguel Alcudia received a warm welcome by a group of friends last night after being released from ICE custody after spending three weeks in prison. In a rare exercise of discretion, ICE dropped Alcudia’s $21,000 bail altogether drawing upon its’ administrative powers to release immigration detainees like Alcudia who are not considered “priority” for deportation adding to questions of why Alcudia was detained in the first place. The release comes after a surge of immigrant detentions in Vermont in recent months and on the heels of broad region-wide support calling for the release of Alcudia including over 2 dozen letters of support from friends and community leaders, a series of rallies and a vibrant 150 person march to the Federal Building in Burlington VT, an action at the St. Albans’s ICE office and nearly 1500 online petition signatures calling for Alcudia’s immediate release. 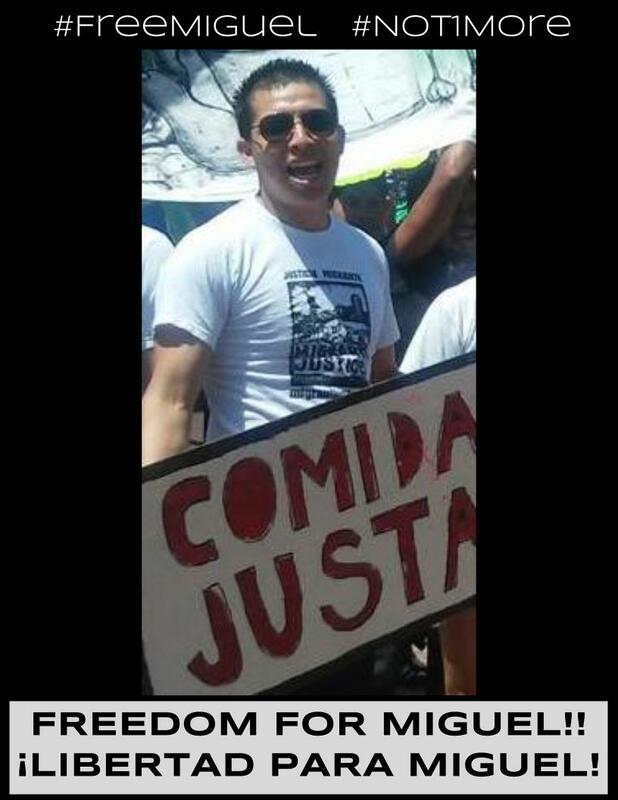 Miguel Alcudia is a dairy worker and leader of the Vermont based human rights organization Migrant Justice. Miguel became a community leader after his wages were stolen on a Vermont dairy farm where he lived and worked. He organized his co-workers to stand up to their abusive employer–and got involved with Migrant Justice. This experience inspired Miguel to be a leader in the Milk with Dignity campaign calling on large corporations to source their milk in compliance with the human rights of farmworkers. Miguel participated in the campaign to successfully secure a commitment from Ben & Jerry’s to join the Milk with Dignity Program. He has played a crucial role, as a farmworker spokesperson on Migrant Justice’s education team, educating other workers about their rights and raising awareness of the public at large about the plight of immigrant workers. Miguel has also participated in region-wide efforts to build connections between immigrant rights and racial justice movements. He is now an active leader of Migrant Justice’s farmworker Coordinating Committee--its main leadership body. This is the second detention of a Migrant Justice leader in recent months. Both Victor Diaz and Miguel Alcudia are public leaders of Migrant Justice, a fact that was commented upon by ICE agents during both arrests. Furthermore, during yesterday’s arrest, ICE agents told Mr. Alcudia that another community leader, mentioning them by name, would be their next arrest. This clear and direct threat against a community leader on the basis of their public activities advocating for human rights is extremely troubling. Please sign below to show your support for Miguel and to call on ICE to use prosecutorial discretion and drop Miguel's immigration case!